Most of the lodges and restaurants in the Khumbu region only accept the Nepalese currency. As the place is relatively cheaper than India in terms of currency value, you can expect a budget of Rs. 1000-1500 per person per day for accommodation and meals. The price would increase for these amenities as you go to higher altitudes. Different items have different charges according to the availability and product. Light weight sleeping bags are a must even though most lodges offer you blankets. It is very common fact that these blankets have a terrible stink and might just not be comfortable enough. It is also advised that you carry a high- quality sleeping bag which can give a comfortable temperature even at -10 C°. You should take along with you, band aids and other sticking plasters as even the most small and unattended blister or wound may turn a wonderful walk into as painful as hell. Do not leave any blister or wound untreated as there are high chances of an infection. Duct tapes are also a good alternative to band- aids. And to enjoy the great view of the mountain and the terrains, binoculars are a must. It would help you to spot the most vibrant and exquisite views of nature in the form of flora and fauna. You can hire a porter as well for the journey who would help you in carrying your backpack and other stuff. If you are strong, then you do not generally need one, but if you do hire a porter, it directs cash into the needy and poor families of the villages. Most of the porters are honest in this area but you should still take care and use your power of judgment to choose the best and loyal among many. An unconcerned and careless choice may just ruin your entire vacation. If you are thinking of hiring a guide, it is advised not to do so if you are trekking up to Tengboche or Pangboche. Above that point, you might have to consider hiring one. The guides would help you in explaining the local sights and guiding you through the path in nights. They might prove to be of great help if you fall ill or suffer any infection or discomfort. The guides generally speak English and other regional languages and also have an official license to operate. however, you should remember that carrying your bags is not a part of their job. But like porters, they manage their own accommodation and meals unless you invite them to join your group. It would definitely be a pleasure thought to get accustomed to their way of living and culture. Day 6 :- Tengboche to Dingboche. You would have a great flight to Kathmandu and land on the Tribhuvan International airport. On your fairly interesting flight, you can have a grand view of some mountain ranges, rivers and waterfalls. Once you reach Kathmandu, you can check-in to your hotel if you have already booked one, or can choose among the many available. After this, you may hire a Sherpa to give you a brief orientation of the city. You would also like to gather more information on the trek and the do’s and don’ts. Kathmandu is also a great place to go around and have a great time. You will trek the Himalayas for some day here. Early morning next day, you would have a flight from Kathmandu to Lukla. You should keep your pen- knifes, lighter, matchboxes and other related stuff in the bigger baggage than in your hand-bag to avoid any security breach and unnecessary delay. The planes are generally small for these flights but the journey is panoramic. On arrival to Lukla, you would be received by your trekking guide, if you have booked one. You will have some time to see Lukla and enjoy its beauty. Your trekking in Nepal would begin from this point. From Phakding, after crossing the Dudh-koshi suspension bridge, the walk is easy and pleasant with short uphill and down-hill climb. You would be re-crossing the same river again. You would have a magnificient view of Thermasarkhu which is 6,608 meters from the village of Benkar. Now you would cross the long suspension bridge over the Bhote- Koshi River. This is a busy area and is full f trekkers and porters. After here you would finally arrive to the small river of Monjo, after a climb of 20 minutes from this area. Here, you can see some interesting water mills which are used for grinding corns and barley. It is one of the major staple diet of the Sherpas. 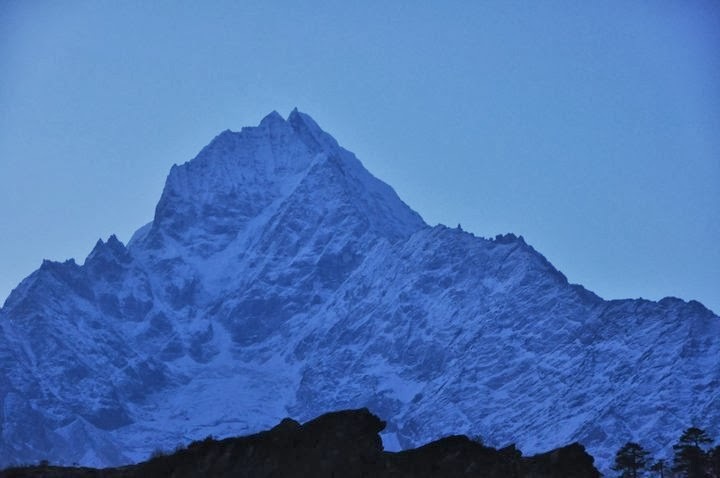 Monjo is situated below the magnificent peak of Thermasharkhu. Close to this you have the entrance to the Sagarmatha national park. At this point, your trekking permit is checked and the officials kleep a record of all the trekkers going ahead. After a gradual walk you would reach Namche bazaar. You can also get prepared for some high altitude trekking. This day is reserved for acclimatization and going around the place. Namche Bazaar is a good place to shop and see magnificent views of the area. You would cherish the view of Kwangde peak and its sister peaks in the east. The houses in Namche Bazaar when looked from a distance appear to be in a U shaped bowl. Here, your walk is over for the day after 5 hours and you can admire and enjoy this religious place. The overnight stay is in guest houses. Dingboche is a lovely place and you will find stone- walls protecting the agricultural fields. The walls are built to protect the crops from cold winds and grazing animals. Your over night stay would again be n guest houses. Dingboche is a lovely and green place. The greenery is spread all around the village and you would find farms and crop- fields all around. The natives here grow crops like barley, buckwheat and potatoes. Dingboche has more than tea- houses so you would also like to have a cup of the same. This day is reserved for acclimatization to the weather and place. You can go for a short walk around the village or might trek to Chukung, which is 3 or 5 hours trek and at a height of 4,730 meters. Chukung is towards the east and lies within the Imjatse valley. Thought the trek is gradual, you would still feel the thin air developing around this place. At Chukung, again there are about five tae- houses and give a superb and over- looking view. You can also explore the valley in the surrounding area and later return to your guest house. 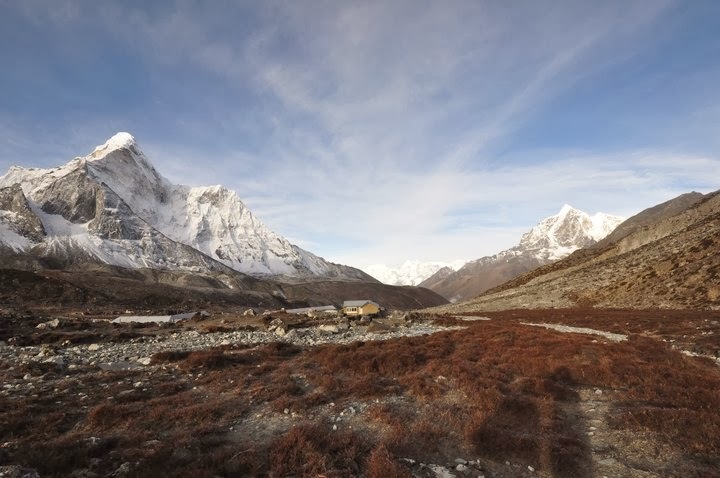 From Dingboche the trail diverts towards the north, and the path is gradual and easy for the first 40 – 50 minutes. After this easy walk you would come to a mani- prayer stupa. From here the trail s slightly down towards Pheriche village. On this day of your walking, you would have a beautiful view of the Mt. 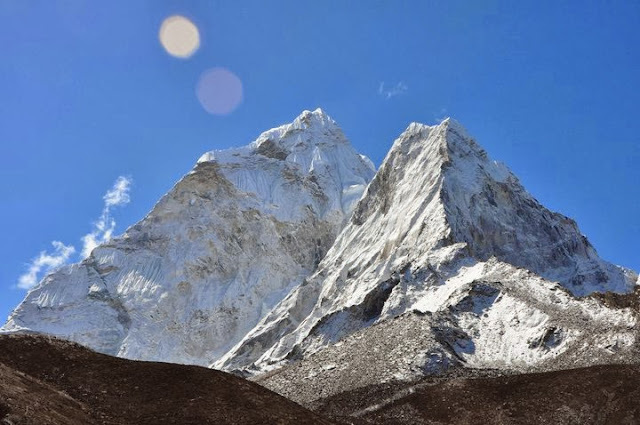 Tawache, Ama Dablam, and Pokalde, which is approximately 5,741 meters towards the north. 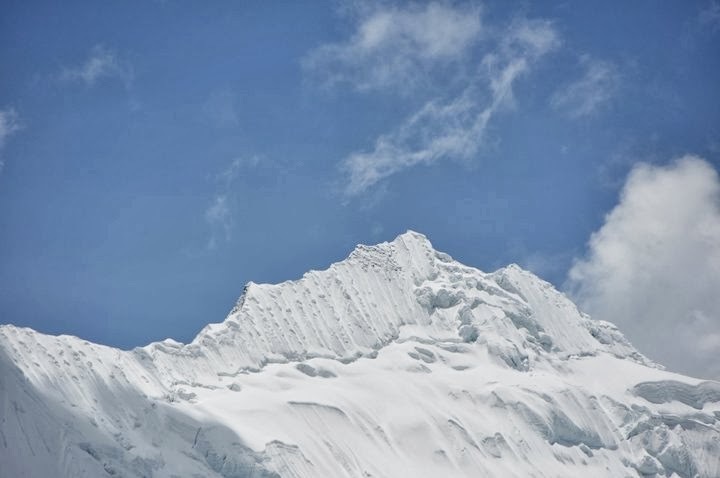 You would also have a view of the great wall of Nuptse. 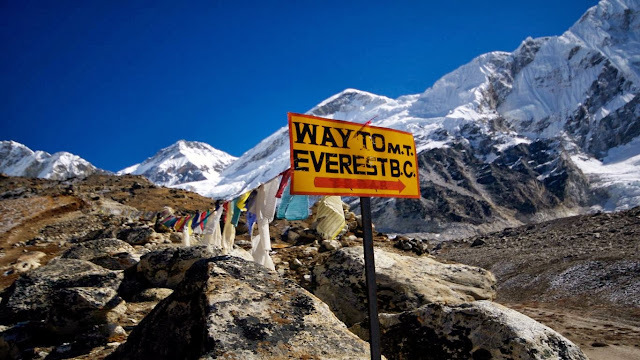 You would have a pleasant walk for the next one and a half to two hours from Pheriche till you reach the small wooded bridge over the river of Khumbu glacier. This place is called Thugla and is the only place which has tea- houses before Lobuche. From here another 3 hours of strenuous trekking time brings you to Lobuche which lies at one corner of the hill. The overnight stay would be in guest houses. Today will be an exciting day for you as you are very close to your final destination. Today you will have an adventurous journey and a great trekking experience. The first walk of an hour is gradual up to the valley and leads to a grassy field. A walk of nearly 20 minutes takes you to the rocky moraine dunes. 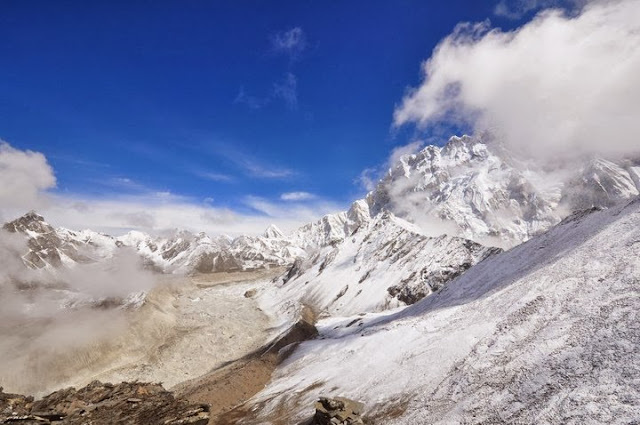 As you go ahead on your journey you can see the icy- glacial ponds and icebergs which lie below the Khumbu glacier. After a few more rocky moraine dunes and a gradual downhill walk, you reach Gorakshep. Day 10: Hike upto KalapaBackpack Holidaysar and retreat trek to Pheriche. After you have trekked to the EBC and returned back to Gorakshep and an over night stay in Guest houses, you are now prepared to climb up to KalapaBackpack Holidaysar. Besides, Gorakshep also is a good place to go around. It has a couple of tea- houses and it also used to be the base camp for trekking the Everest in the 1950’s. The walk towards Kalapather from Gorakshep starts with a few minutes of easy walk. All this while, you will be walking in the sandy fields. After here, there is a steep climb for about 45 minutes. Post this tiresome and strenuous mountaineering, you would come to the level fields and the walk from here is easy ad gradual. You would have the comfort of walking for the next one hour, post which there is again a steep trek to the top of KalapaBackpack Holidaysar for about half an hour. The Everest from this point looks closer than you will imagine. After here, you trek back to Pheriche. Day 11: Pheriche to Namche bazaar. After you have already reached your final destination the previous day, your cumbersome trekking time is almost over. You have done the Everest base camp trek and a lot of Himalayan treks. From this day onwards, you would have pleasant and easy walks throughout. You will be heading downwards to lower elevations. The walk is similar all the while to Thugla. After you reach the ridge, you would follow the stream and start traveling towards Pheriche valley. After a walk of around 40 minutes you reach the valley floor. You can take another one hour of easy and simple walk to reach Pheriche which is at 4,243 meters. You would have a wonderful the treks in Nepal by now. You trek down the slope to reach Namche bazaar. Once you reach here, the walk for the day is over and you would spend the night in guest houses and enjoy the local meals. Once you wake up to the lovely weather in Namche Bazaar, you would like to visit the place and go around a little bit, before you start your downhill journey. You can visit the local markets of Namche Bazaar and have a look at the local art crafts and handicrafts. You can buy a lot of stuff from here to make your journey memorable. You would like to have a small walk in and around the Sagarmatha National Park. It is a good place for photography and collecting memories. You would also enjoy the local food which has a distinct taste. The trek from Namche Bazaar to Phakding is again a simple and easy walk. You would be trekking down the slope most of the time. The beauty of the forest and distant mountains with several water- falls add to your journey a great delight. This is the beauty of Nepal trekking. This is the last day of your trekking in Nepal. Today you would have a good walk to Lukla. You can take your time and relax on your way. You would also take beaks to enjoy the natural beauty on the way. There will be a few up hill climbs but you will manage it very easily. The lush green beauty and forests will take your pain away. After this easy walk you would reach Lukla. 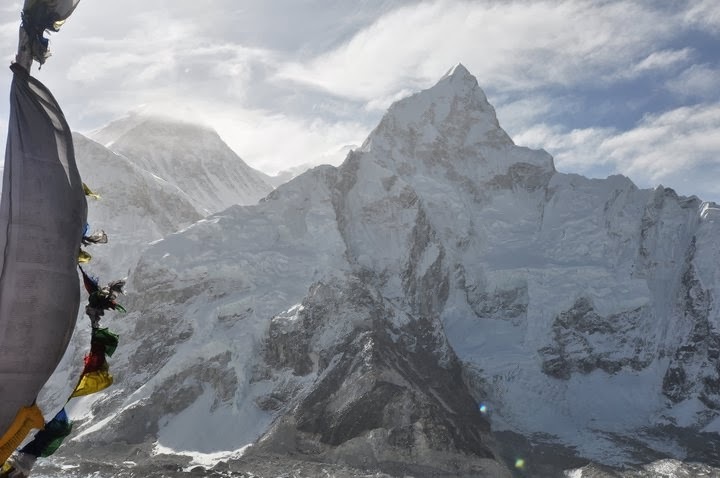 This will be your last day with the Sherpas and other crew members, so you would like to enjoy the day with a delicious dinner and a few drinks. On this day you would have to wake up early as the flights to Kathmandu are generally scheduled in the morning. This is because during daytime, the weather is generally windy and there might be a delay in the flight timings. However you expect a slight delay in you r early morning flight as well if the weather is not suitable. 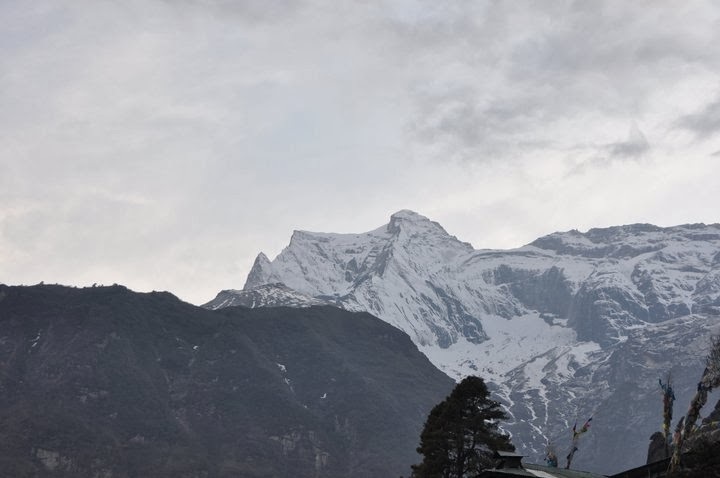 As you make your way through the security checks and your flight takes off from Lukla airport, you would have a magnanimous view of the surrounding. Consider yourself lucky if you manage to get a window seat as you would take about 45 minutes to reach Kathmandu. After you have visited Kathmandu for a day, you are prepared to depart from Kathmandu, Nepal. You have by now enjoyed the panoramic view of nature, mountains and rivers. You will be transferred to the International airport by your hotel’s taxi or the one you have arranged yourself. And this would mark your departure after an excellent trekking in Nepal. Most major air carriers like Indian Airlines (www.indian-airlines.nic.in) Jet airways (www.jetairways.com) operate daily flights to Kathmandu. Reaching Kathmandu by flight from New Delhi is the most convenient way. • Day 2: Take a bus or jeep from Gorakhpur to the Nepalese frontier at Sunauli (Indian side) and Bhairawa (Nepalese side, often also called Sunauli). Journey time about 3 hours, Rs. 55 (£1 or $2). • Walk across the frontier, it's then a few minutes’ walk to the Bhairawa bus station. Take a bus or jeep on to Kathmandu. Buses take 9 to 12 hours, cost about 120 Nepalese Rupees or 230 Indian Rupees (£1 or $2). There are many buses daily, either daytime buses leaving regularly until about 11:00 or overnight buses leaving regularly from about 16:00 until 19:00. Indian rupees may be accepted here in Bhairawa, but not further into Nepal. • It's also possible to travel via Varanasi. An overnight train links Delhi & Varanasi. Buses link Varanasi with the Nepalese border. 1. 2 Nights hotel accommodation in Kathmandu..
2. Breakfast, lunch and dinner during the trek. 3. Food while on treks (Veg.). 4. Government licensed guides and experienced porters, ( including their food, salary, accommodation, equipment, medicine & insurance). 5. Qualified & experienced trek leader and support staff. 6. All local transportation including flight tickets to and from Lukla. 10. Porter for personal luggage (10 Kg). 11. All necessary permits and entry fees. 3. Nepal entry visa fee ($40) only for foreigners. 4. Any personal expenses like shower and battery charges in the mountain. 5. Staff & driver tipping. Note : Normally BACKPACK HOLIDAYS expect to carry your personal luggage on your own, if you don’t want to carry your backpack so you can give it to porter, but you have to inform us in advance and have to pay Rs. 300/- extra per day per bag.